There are several local resources for picky eaters - nutritionists, occupational therapists, and psychologists. Feel free to ask for a referral if you are concerned. Whitney Rich, a longtime nutritionist at Cincinnati Children's Hospital is now seeing patients privately at our office for a variety of services. Click here for more information. Just published! 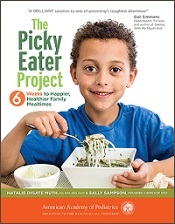 The Picky Eater Project: 6 Weeks to Happier, Healthier Family Mealtimes offers a clear strategy and more than 40 family-friendly recipes to help children become more adventurous eaters. Picky eaters of all ages will be transformed into fledgling foodies! Parents will be amazed at what their kids will try when they are engaged in shopping for and preparing healthy meals and snacks.